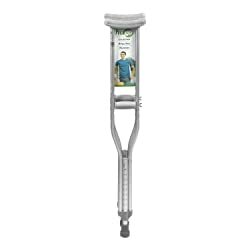 Crutches are one of the most medical equipment usually required after sustaining an injury or undergoing a surgery. They help individuals to walk without putting any weight on the injured foot or leg. Moreover, they enhance your mobility independence as well as reduce symptoms hence shortening your recovery time. 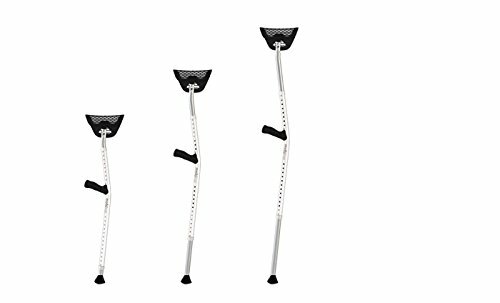 To help you get the right crutch, here we are reviewing top 10 best crutches. 1.4 Who should use it? 2.4 Who should use it? 3.4 Who should use it? 4.4 Who should use it? 5.4 Who should use it? 6.4 Who should use it? 7.4 Who should use it? 8.4 Who should use it? 9.3 Who should use it? 10.4 Who should use it? 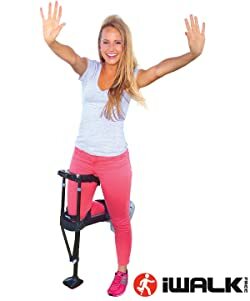 The Millennial Medical In-motion Pro Ergonomic Folding Crutches help you reduce pressure your underarm and wrist. They also prevent carpal tunnel syndrome and nerve damage related to long-term use of crutches. 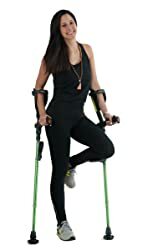 Millennial Medical In-motion Pro Ergonomic Folding Crutches comes in 3 sizes which fit patients between 4’6 inches and 7’2 inches. It can also hold up to a maximum capacity of 500 pounds. 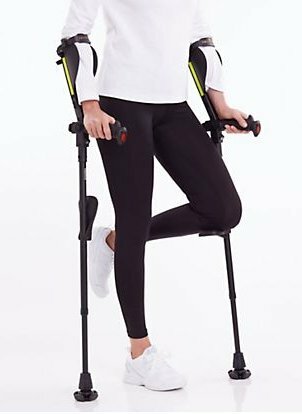 Mobilegs Ultra is for patients with permanent or long-term disabilities as well as those recovering from an operation in mind. They make walking easier, safer and less painful for these patients. This is the reason why many hospitals, emergency care centers, and medical practitioners today recommend Mobilegs Ultra. Scroll Down for Pros & Cons ! 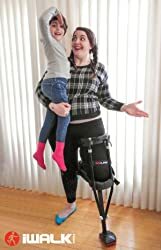 Mobilegs Ultra Crutches have fully adjustable arm length and height that perfectly fits approximately 98% of all adults whose height ranges from 4’9” to 6’4”. It can also support users with a maximum weight capacity of 300 pounds. The 7th Generation Prime Ergobaum crutches are designed by a medical practitioner with interests of patients recovering from surgery or injuries as well as those with long-term disabilities at heart. 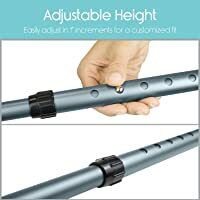 Ergobaum 7th Generation by Ergoactives is for all patients whose height ranges from 5” to 6’5”. It can also support 350 pounds. 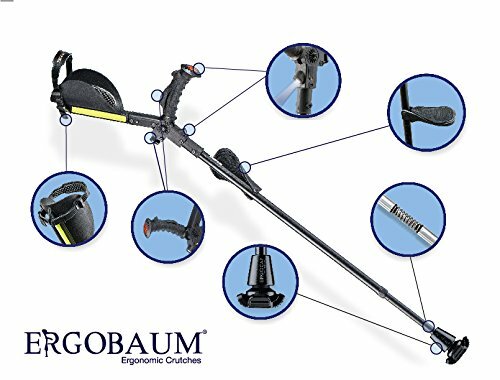 Ergobaum Prime Crutches are the latest and re-inspired crutches of Ergoactives. 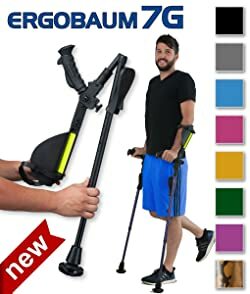 Ergobaum Prime Crutches has fully adjustable features (arm length and height) that fit about 99% of all whose height is between 5” and 6.5”. It also supports a maximum weight capacity of 350 pounds. Keep Reading to Know Better Crutches! Weighing only 600 grams (1.32 pounds) per crutch, Ergodynamic Forearm Crutches is the lightest crutches in the world. It is also integrated with a shock absorber. 3 shock absorber weight range options: small (154 pounds), medium (132 to 198 pounds) and large ̣(over 176 pounds). Although each crutch weighs only 600 grams, the Ergodynamic Forearm Crutches have a maximum capacity of holding up to 286 pounds as a pair. It is also adjustable for use by patients who are 4.7 inches to 6.8 inches. 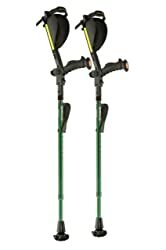 Forearm Crutches by Vive (Pair) – Lightweight Arm Cuff Crutch is doctor-recommended, fully adjustable and very efficient crutches. They are well-designed to accelerate your healing process while keeping your mobility throughout the healing process in mind. 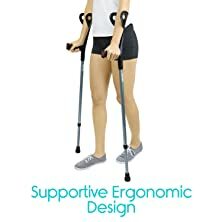 Forearm Crutches by Vive (Pair) can be used all adult of different heights. This is because it comes with easy push-button adjustment for a personalized fit. Also with its sturdy aluminum frame, it can support patients weighing up to a maximum of 300lbs. If mobility independence is all you want besides a handicap, then Drive Medical Aluminum Crutch is the best mobility devices to opt for. They allow you to move from one place to another on your own without taking much space. Each crutch is made of a center tube which is double extruded. This helps improve strength and stability on weight-bearing portions. 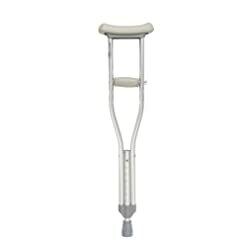 Drive Medical Aluminum Crutch has an overall height of 53.5 inches and is a perfect fit for people with 70” to 78”. It can support up to 500 pounds weight capacity. This means people struggling with weight issues are well-catered for. It is also a good unit to consider after undergoing the knife. 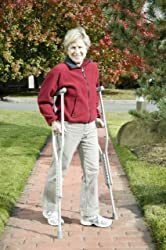 Medline MDS805161 Aluminum Forearm Crutches are a perfect alternative to the conventional armpit crutches. If BMI is an issue, this is a device to consider even before undergoing the surgery. 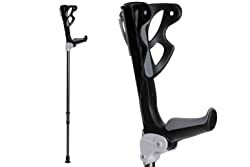 Although most people prefer axillary crutches, Medline MDS805161 is the perfect choice for patients who will need to use crutches permanently or for a few years. Equipped with the rubber handles, this unit is very comfortable and secure to hold. 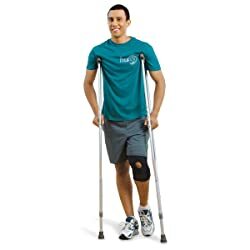 Medline MDS805161 Forearm Crutches are a good pick for individuals who can stand well or walk partly. It is, therefore, wise to purchase this set in an event of small injury or after a surgery. 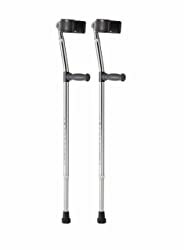 Hugo Mobility 721-785 Aluminum Crutches come with an anodized aluminum construction that makes it durable. Their adjustable size allows them to accommodate almost all adult. 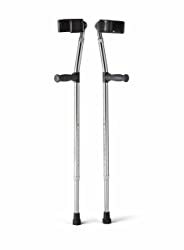 Hugo Mobility 721-785 Aluminum Crutches can accommodate individuals whose height is between 5’2” and 5’10”. It can also hold up a maximum capacity of 300 lbs. Keep Reading to Know Which is the Best! 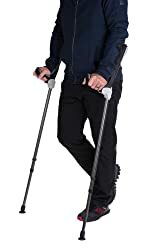 iWalk2.0 Hand Free Knee Crutch is a bestselling product by iWalkFree. 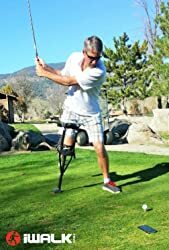 It is an alternative to traditional axillary or forearm crutches. It is very intuitive to use and converts in few seconds for use on either the left or right leg. Its 6mm clamp bolt is very short while the nuts eventually vibrate off. iWalk 2.0 Hands-Free Knee Crutch perfectly fits anyone between 155cm (5.1”) and 185.5cm (6.2”). Those less than 155cm or above 185.5cm should check with the manufacturer’s chart. 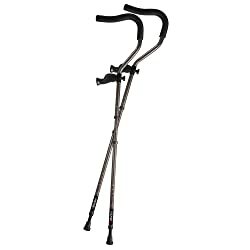 Elderly can also use this crutch. This is because physical capabilities vary from one person to another as they age. Therefore age limits do not matter here but ability limits do. However, if you are plus size, iWalkFree may not be the right walking aid equipment for you. All crutches need strength for proper use. 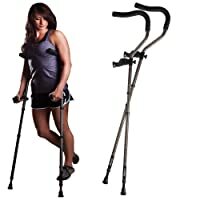 A good crutch is the one that distributes one’s weight evenly throughout the upper body. Make sure you get a crutch with a wider tip because it increases the surface area touching the ground. Most crutches can hold 250 to 300 lbs. This means if you are weighing more than this, you will require heavy-duty or bariatric mobility aids so that the aluminum frame does not buckle or bend during use. All types of crutches cause strain on one’s hands and wrists. This is the reason some handles have either ergonomic shaping or handles with additional padding.